Consumer reviews are a valuable resource when making any purchase, and an ice cream maker is no exception. Ice cream maker reviews written by real people can offer information that you can't find anywhere else. People who have actually used a product can tell you honestly what the pros and cons are and help you find the best ice cream maker for you. However, reading ice cream maker reviews should not be the starting point of your decision process unless you plan on dedicating a great deal of unnecessary time to your quest. It's better to spend a few minutes now thinking about what you're looking for in a best ice cream maker. There is a lot to consider when deciding which ice cream maker is best for you. Size, power, reliability and method of freezing are all important. We suggest you first use these important criteria to narrow your ice cream maker search. Don't waste your time reading countless reviews for ice cream makers that won't meet your specific needs. When you are ready, the ice cream makers are categorized to the right by type. Click on the type that best suits your needs for detailed information and ice cream maker reviews. Underneath that you will find reviews separated by price range. There is also a section below that where they are categorized by brand. Use this if you've already narrowed your search down to a specific brand of ice cream maker. We want to make it easy for you to search ice cream makers in the way best suited to you. Ice cream maker type refers to the method of freezing used and tends to influence the price of an ice cream maker more than anything else. It is important to realize what makes good ice cream in order to know which type of machine is best for you. A good, smooth ice cream has very small ice crystals. The quicker the ice cream is frozen, the smaller the ice crystals will be. While modern ice cream companies like to use idyllic image invoking phrases such as "slow churned," this is definitely one instance where quicker is better. You want your ice cream to freeze fast and to freeze evenly. Rock salt ice cream makers are typically the least expensive, yet they do produce a decent ice cream. The rock salt helps freeze the ice cream quickly, minimizing ice crystal development. The biggest drawback to these types of ice cream makers is the ease of use. Rock salt ice cream makers can be a pain to use, especially the hand crank types; although those can provide a fun form of exercise for children. These types of ice cream makers require the addition of rock salt and large amounts of ice. Rock salt ice cream makers can be manual (requiring hand-cranking or other form of manual movement) or can be powered by a motor. Freezer bowl ice cream makers are very popular because they are inexpensive and quite easy to use. They utilize a double walled bowl that has a sealed liquid inside the walls. The ice cream maker bowl is placed in the freezer until frozen solid. The frozen bowl then is used to freeze the ice cream. You will find some reviews for freezer bowl ice cream makers where the review states that the mix never froze; this is usually due to that particular review being written by someone who does not keep his or her freezer cold enough. The colder your freezer is, the colder the bowl will get and the quicker the ice cream will freeze. We recommend your freezer be kept at 10 degrees F or lower for use of this product. A freezer bowl ice cream maker is normally easy to use and very dependable. It will make good ice cream, but not as good as the high end machines. The bowl needs to be frozen between batches, limiting the ability to make more than one flavor of ice cream in the same day. Compressor ice cream makers, also know as self-refrigerating, are the best type available. They are also the most expensive. These ice cream makers have a compressor to provide quick and even freezing. There is no need to freeze a bowl or add rock salt; the ice cream maker actually generates the cooling power needed. This allows for minimum ice crystal formation and leads to the best possible ice cream. Adequate power is crucial in a compressor ice cream maker; use the ice cream maker reviews to see if a model you are considering has sufficient power. This type of ice cream maker allows you to make batch after batch of ice cream without needing to re-freeze a bowl. Power is an important aspect of a good ice cream maker. A well powered machine will give you easy, consistent and uniform results. An inadequately powered ice cream maker will lead to poor results. What are "poor" results? An ice cream that either does not freeze completely through or that has large ice crystals which don't provide a smooth texture. What size motor does your ice cream maker need? There isn't an easy answer to that question. The more efficient an ice cream maker is, the less power it will use or need. This is one area where consumer ice cream maker reviews are quite handy. The reviews can let you know if a specific ice cream maker has adequate power. A more powerful ice cream maker will be heavier. This can be inconvenient when trying to get it out of the cupboard but it will be able to deliver better results. The extra weight also adds to the stability of the ice cream maker, lessoning or eliminating shaking while in use. This is definitely an area where reviews are crucial. Reviews are the best way to get unbiased information. Another way to gauge the reliability of a specific ice cream maker is through the reputation of the maker. A good warranty can also give you piece of mind. 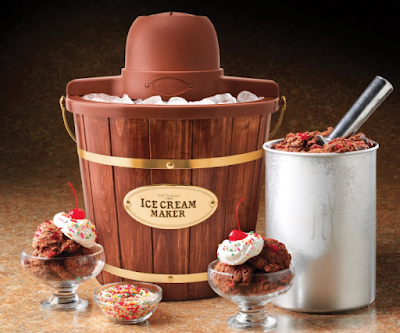 Now you should have a better idea of what to look for to get the best ice cream maker for you. To the right you will find ice cream makers categorized by type, price and brand. There you will find detailed information on specific ice cream makers as well as consumer ice cream maker reviews. Keep in mind that some of the ice cream maker reviews are written by inexperienced cooks who haven't worked much with ice cream makers. If 9 out of 10 people are overjoyed with the performance of a ice cream maker keep that in perspective when the 10th person says it's junk. Some "problems" may just be a lack of understanding when it comes to ice cream maker usage and expectations. We also provide an overview of the ice cream maker reviews along with an overall rating to prevent you from wasting your time reading hundreds of reviews for a best ice cream maker that isn't well suited to your needs. Looking for ways to break in your new ice cream maker? Start with our free ice cream maker recipes. Hungry for more? Move on to the "Cookbooks" section. It has books filled with recipes that will help you get the most out of your ice cream maker. Now that you've picked out the best ice cream maker you'll want the best cookbook to go with it. You'll find helpful consumer reviews available for those too!